Equistro Kerabol Biotin is formulated to support healthy hoof & hair metabolism, giving your horse strong hooves & a shiny coat. As well as Biotin, it contains Methionine; Zinc; Manganese & Selenium. 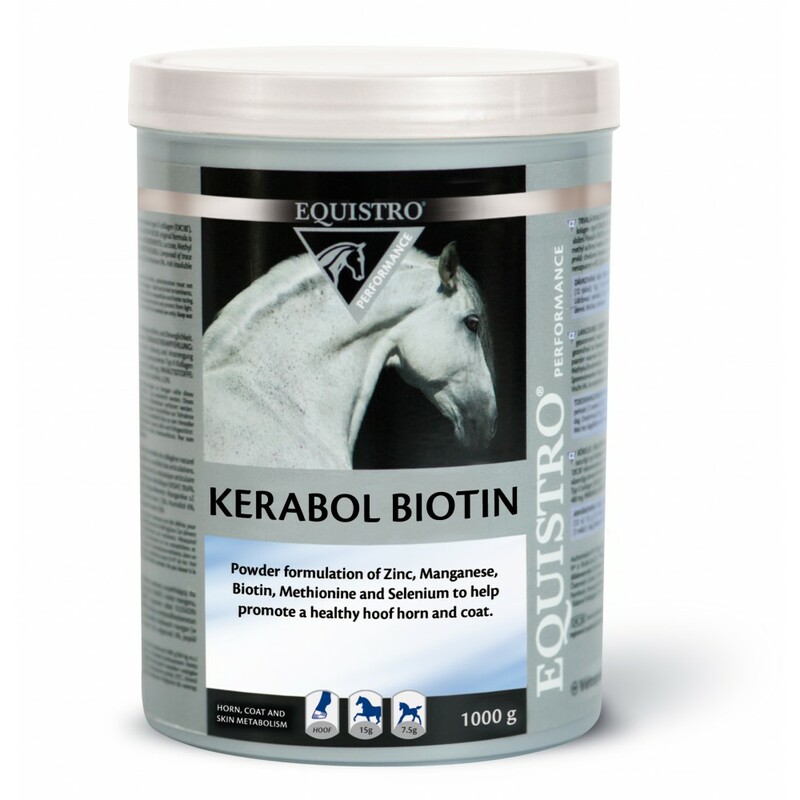 The form of Biotin in Equistro Kerabol Biotin, is D-Biotin, which is the most effective type for improving the quality of your horse's hooves. Kevin Bacon's Hoof Formula is a quality hoof supplement, developed by vets, containing high, balanced levels of nutrients to promote excellent horn growth. NAF Five Star ProFeet contain all the key nutrients necessary to support healthy hoof growth in your horse. It has been developed by vets & farriers to help treat & prevent against cracked, brittle feet. Aloeride is a certified organic, palatable Aloe Vera powder. One month supply of Aloeride sachets contains the equivalent of 12 litres of Aloe Vera juice. Aloeride contains a much higher concentration of Aloe Vera than other products on the market. Farrier's Formula is one of the best known & most popular hoof supplements. When fed daily, it is very effective at improving all types of hoof disease & problems, by supplying all the nutrients needed for healthy horn growth. Hoofmaker provides nutrients that a required to protect and nourish every layer of the hoof horn tp help aid growth, repair and maintenance. Hoofmaker Concentrated Pellets is a complete feed to ensure your horse has healthy hooves.